This election season, "the wall" has become a staple of divisive political rhetoric. But sometimes, walls can be markers of unity. 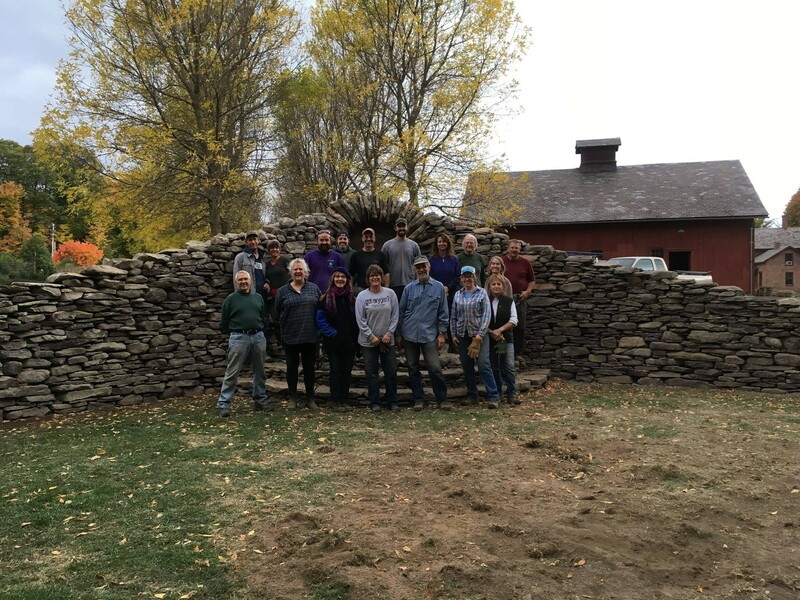 Last Monday, Gardener's Supply and the Intervale Center in Burlington unveiled a new sculptural stone wall, created under the guidance of celebrated Morrisville artist Thea Alvin. 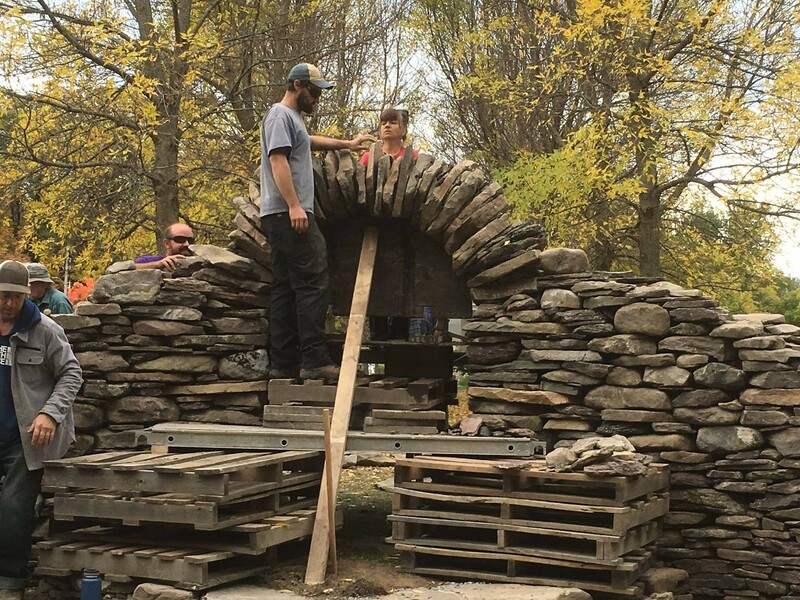 For three days, 12 paying stone masonry students worked to transform roughly 75,000 pounds of stone into a gracefully sloping wall and archway, dubbed "Allée Portal" by Alvin. Students at work on "Allée Portal"
"I'm just so happy that this was able to come together, with so many different players," said Pat Pearsall, general manager of retail stores at Gardener's Supply. Pearsall worked with Alvin and students last year to put up a similar wall at the store's Williston location. "Allée Portal," he said, arose from conversations with Intervale director Travis Marcotte about how to engage visitors — "to give them something that improves their experience." Additionally, Pearsall said, it was important to him that the addition not be "some big, expensive installation that someone just came and did." "Allée Portal" is in good company in Vermont, where Alvin has constructed works in locations including Johnson's Vermont Studio Center, Saint Michael's College and the Dharma Door retreat center in Underhill. "Allée Portal" sits at the northern end of a romantic (and photogenic) tree-lined avenue. As Pearsall put it, "You just want to see what's on the other side." Through its gravity-defying archway is a small pond, flanked by a weeping willow and bench. Pearsall sees wedding potential. The installation coincides with the Vermont Department of Tourism and Marketing's release of the Stone Trail Guide. The booklet celebrates the state's stone heritage, from Barre's granite quarries to the iconic centuries-old stone walls that crisscross the landscape. Alvin's design honors the tradition of the latter, and "Allée Portal" looks as though it could have been in its current site, as Pearsall put it, "forever."